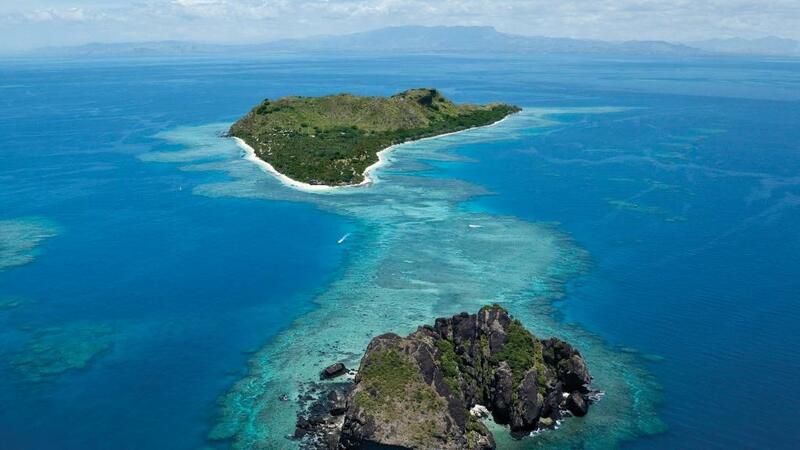 Beautiful Vomo Island Resort is located in the Northern Mamanuca Islands of Fiji, a 15 minute flight by heli transfer or seaplane. Launch transfers to Vomo are also available. 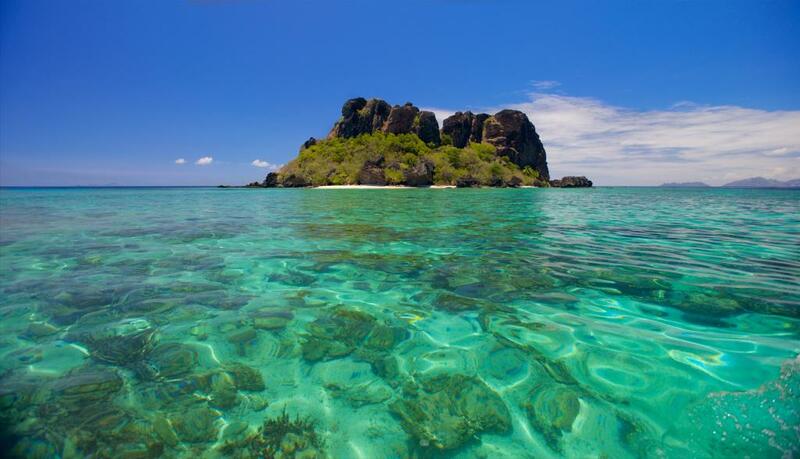 Vomo Island is a secluded tropical paradise, a truly intimate island experience where facilities are five star. 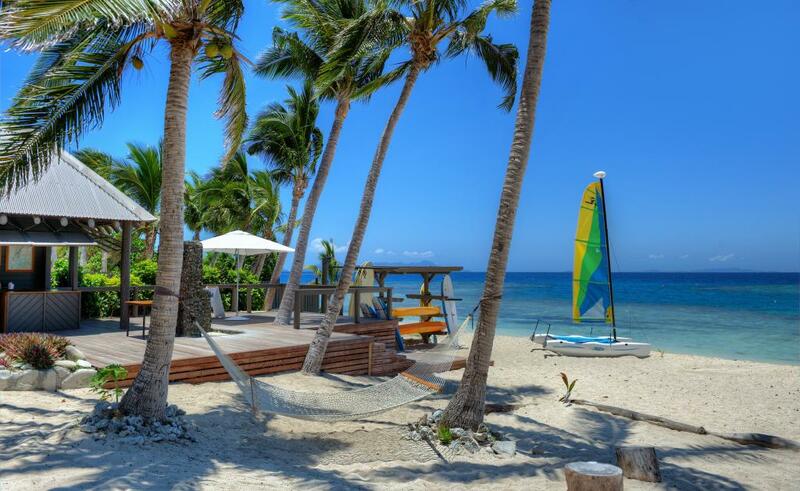 This Fiji resort has numerous activities on offer including snorkelling, sailing, windsurfing, fishing, golf (9 hole course) and for those who like to relax and be pampered, the superb Senikai Spa. Offering 32 luxuriously appointed fully air-conditioned bures and residences, Vomo Island Resort is the ideal private getaway destination. Your own spacious villa is nestled either between the palms and frangipani trees on the beachfront or tucked away into the hillside with stunning panoramic ocean views. The resort also features complimentary wireless internet throughout. Bathrooms include L'Occitane products and Vomo also offers a complimentary, same day laundry service with garments returned to your room, wrapped in tissue. It's these unique touches of luxury that make Vomo Island Resort special. As well as being a perfect location for a romantic getaway, Vomo also recognises that family holidays are important too and welcomes children of all ages through the year. The Turtle Club is Vomo's kids program and operates at particular dates throughout the year. 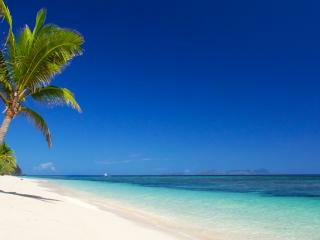 At Vomo Island Resort there is something for everyone, and provides a truly unique Fijian holiday experience. Notice 1: Undergoing construction of two new multi-bedroom residences, due for completion early 2020. 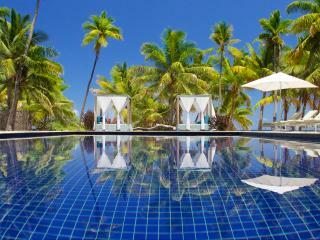 Vomo Island Resort offers 32 luxuriously appointed bures and residences. Fully refurbished, the villa's are spacious, air-conditioned and private. Filled with perfumed candles, fresh local fruits and flowers, Vomo's Villas are elegant and stylish keeping with the natural beauty of the island. Every villa features an extended sun deck with reclining loungers and al fresco dining table and chairs. 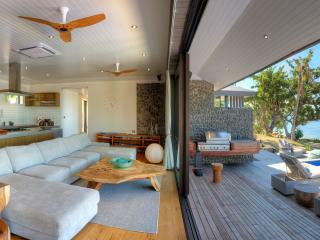 Inside the villa you can unwind in a luxurious sleeping area and separate living and dressing area. 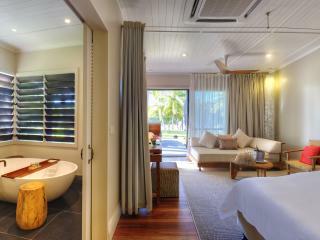 There is a private spa in the bathroom so you can soak up some island serenity with a glass of champagne. Hillside Villa: The free standing Hillside Villas are located in both the garden and on the hillside. 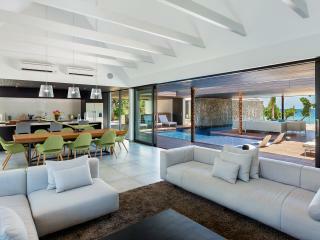 Their open plan feature a lounge area with a single day bed, which can be separated by a privacy curtain. The Hillside Villas are raised from the ground so can be challenging to monitor small children. These villas are not suitable for guests with any physical impairment/special needs. The higher Hillside Villas feature water views. These may be requested but not guaranteed. Room & deck area is 55m². Bedding is 1 King bed + 1 Single Bed or 3 Single Beds. Maximum room capacity is 3 Adults or 2 Adults and 2 Children. 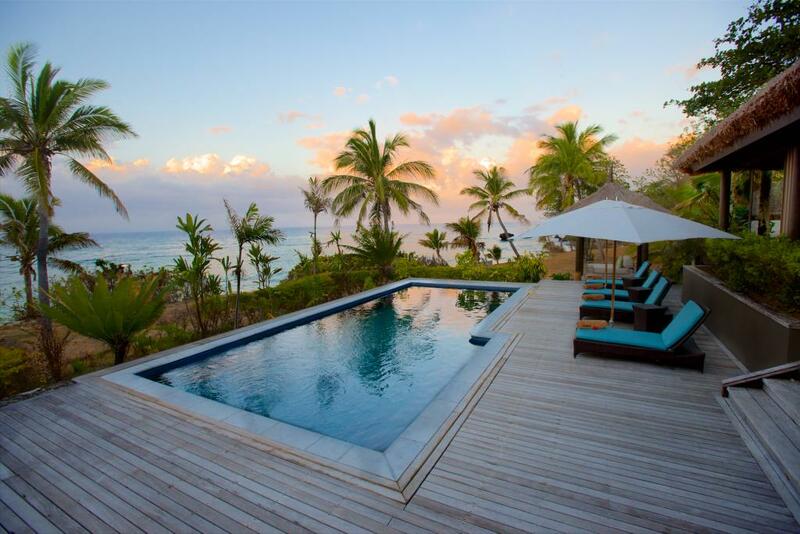 Beachfront Villa: Literally a few steps to your own secluded beach. Interconnecting rooms available. Features extended decks with lounge chairs, al fresco dining and separate living area. These villas feature a privacy curtain to separate the bed from the living area. Most Beachfront Villas have 3 or 4 stairs onto the deck and cannot be accessed by wheelchair. Room & deck area is 65m². Bedding is 1 King bed + 1 Single Bed or 3 Single Beds. Maximum room capacity is 3 Adults or 2 Adults and 2 Children. 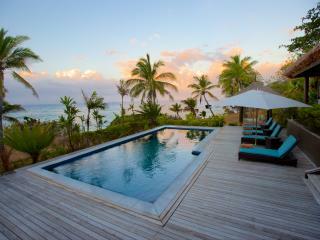 Beachfront Haven: These freestanding villas are literally a few steps to your own secluded beach. Features extended decks with lounge chairs, al fresco dining and separate living area. These villas feature a privacy curtain to separate the bed from the living area. Room & deck area is 65m². Bedding is Bedding is 1 King bed + 1 Single Bed or 3 Single Beds. Maximum room capacity is 3 Adults or 2 Adults and 2 Children. Beachfront Retreat: The Beachfront Retreat Villas are located on the beach front, offering 85m² of bedroom, living and decking area incorporating the latest in modern technology and design. These open plan villas offer a large living area with music system, a spacious deck with outdoor rain shower and direct access to the beach. 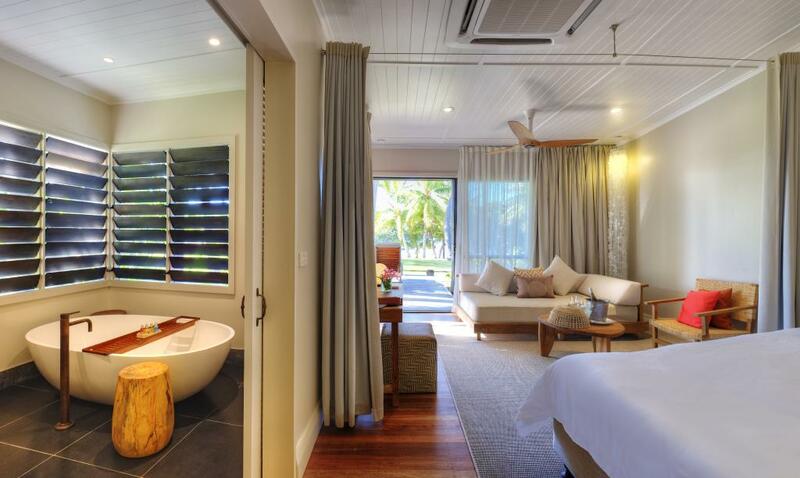 The villas feature a privacy curtain to separate the bed from the living area. Bedding is 1 King bed + 1 Single Bed or 3 Single Beds. Maximum room capacity is 3 Adults + 1 Child or 2 Adults and 3 Children. 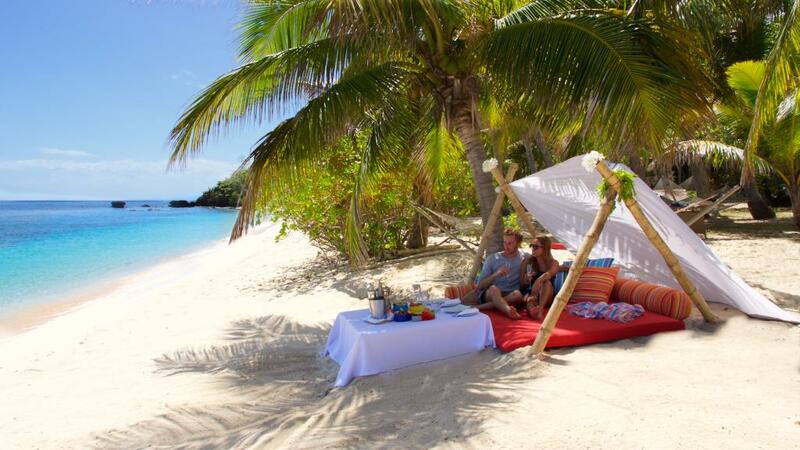 There are four Residences at Vomo Island Resort, offering a level of privacy and luxury surpassing other Fiji Island accommodation. Each residence features a private swimming pool, butler service and kitchen facilities, making them the ideal home-away-from-home. Royal Villa: Located on the beach front in a private location at the end of the Yasawa beach, The Royal has a definite ambience about it. Spacious 200 sqm in size, with 3 deluxe bedrooms each with a King bed and 2 ensuite bathrooms. Villa also has separate living room with video and stereo system and dining area and large screen plasma TV with Cable channels. Extensive outdoor decking, private outdoor shower and large private outdoor swimming pool. Bedding is 3 Kings Beds or 6 Single Beds. Maximum villa capacity is 7 Adults & Children. The BeacHouse: This luxurious residence is the ultimate in sophisticated and contemporary island living, offer indoor and outdoor living, with multiple relaxation areas for al fresco entertaining around the 14 metre infinity pool. Spanning the width of its 1-acre site, the three-bedroom beachfront property features a modern fully equipped kitchen (for chef’s to come and cook), lounge room and media room. There are barbecues in two separate areas with one incorporating a ‘boma’ with wood burning pizza oven and grills. Bedding is 3 x King beds which can be split into 2 x Single beds each. Maximum villa capacity is 7 Adults & Children. The Residence: The palatial and very private Residence is located on the beach front of the Yasawa beach and features a total of 4 bedrooms across 3 separate pavilions. 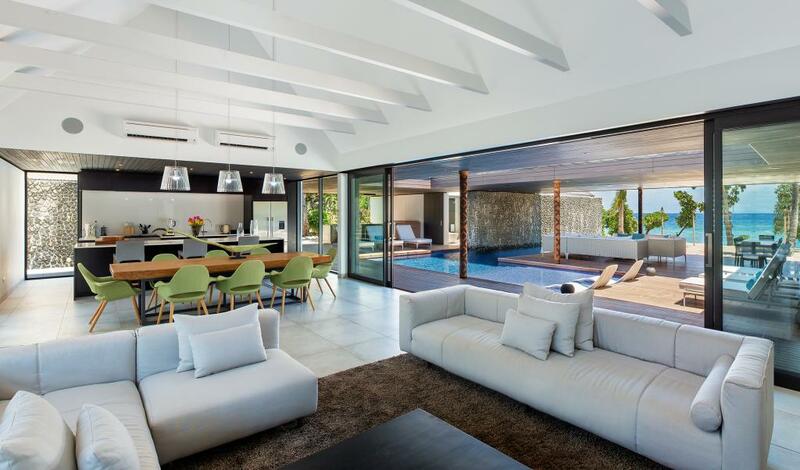 The main house features a kitchen, indoor dining area, lounge room, outdoor alfresco dining area with long table overlooking the expansive lawn area with large swimming pool on the beachfront. There are large day beds along the verandah, which is the perfect spot for relaxation and refreshments as you gaze out to the ocean. The Residence is the ultimate in sophisticated island living, especially for those who like a little separation from each other. Bedding is 4 x King beds which can be split into 2 x Single beds each. Maximum villa capacity is 10 Adults & Children. The Palms: The largest and newest of the private residences is the ultra luxury 4 bedroom Palms, located next to The BeacHouse on the Yasawa beachfront. The Palms is a grand home, set amidst pools and water walls and offering the ultimate ‘live in – live out’ environment, complimented with bespoke hand made furnishings. From the grand porte cochere entry, you step inside to the hub of the house – the main living areas, consisting of open plan lounge and service kitchen that look out over the long U shaped swimming pool. Four bedrooms are stylishly designed and three of the oversized bedrooms feature lounge areas and deep luxurious baths in the bathroom. 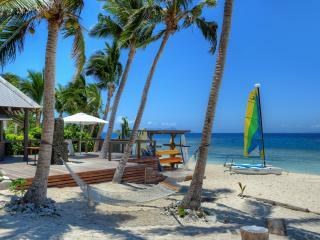 Perfect for families or for a group of friends, The Palms is one of Fiji’s most luxurious homes. Bedding is 4 x King beds which can be split into 2 x Single beds each. Maximum villa capacity is 10 Adults & Children. 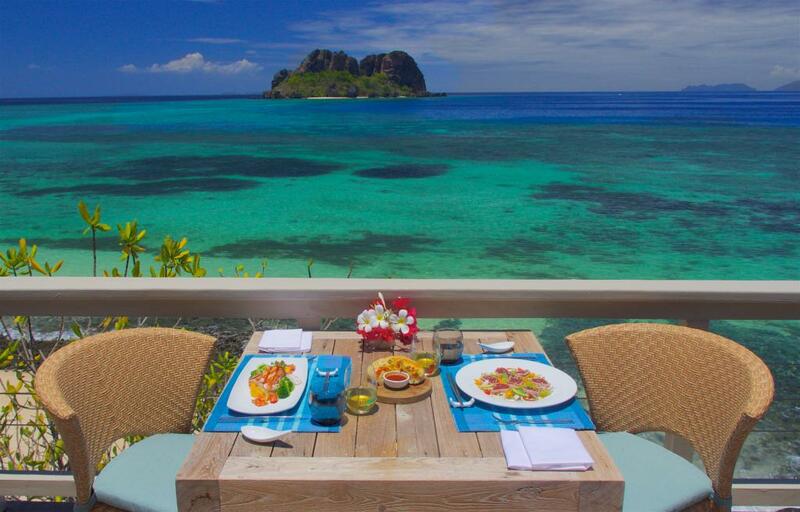 Vomo Island Resort's chef serves the finest Pacific Island produce, with a focus on succulent seafood fresh from the sea and fruit and vegetables that taste of the sun, all served with exceptional wines. 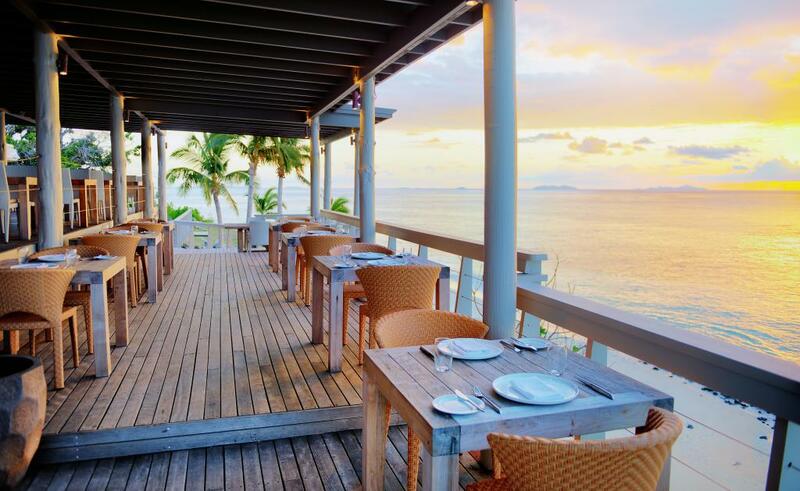 The Reef Restaurant: The Reef Restaurant is centrally located and overlooks the fresh water swimming pool, sandy beaches and distant islands. The day begins with an a la carte breakfast menu that provides delectable sustenance for a day filled with leisure activities. A daily changing light island style lunch menu includes salads and fresh ocean catches. 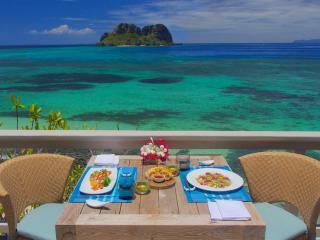 The evening menu offers a comprehensive selection of international and South Pacific Island specialities. Vuda Bar: Located adjacent to the fresh water swimming pool, the Vuda Bar provides a calm oasis to relax at any time of the day. Guest's can begin the day with an espresso and newspaper, hide away and enjoy exotic tropical cocktails for two or gather together and take the opportunity to make new friends. A comprehensive selection of international wines compliments the vast array of beverages on offer. Rocks Bar: The Rocks Bar is located at the westerly point of Vomo Island overlooking the island of Vomo Lailai, white sandy beaches, clear ocean waters, live coral reefs and spectacular sunsets. The Rocks is open during sunset cocktail hours. Beverages include a full range of pre-dinner cocktails, tropical island cocktails and selected international wines. 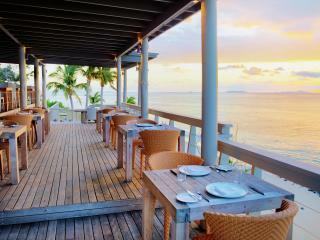 The Rocks Bar is a stunning setting to watch an unsurpassed sunset in the Fiji Islands. The minimum age at the Rocks Bar is 16 years. Private Dining: A myriad of dining options are available. 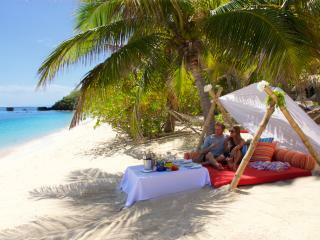 You can relax and dine al fresco at your villa or partake of an exclusive and intimate candlelit dinner on the beach. You can request anything from vintage champagne to a simple pot of tea to be served at any location on the island, and at any time. Picnic platforms scattered discreetly around Vomo's beaches provide an ideal beachside meal venue and enables a seamless day of swimming and snorkelling in the azure ocean just a few footsteps away. Private dining options are limited only by your imagination. 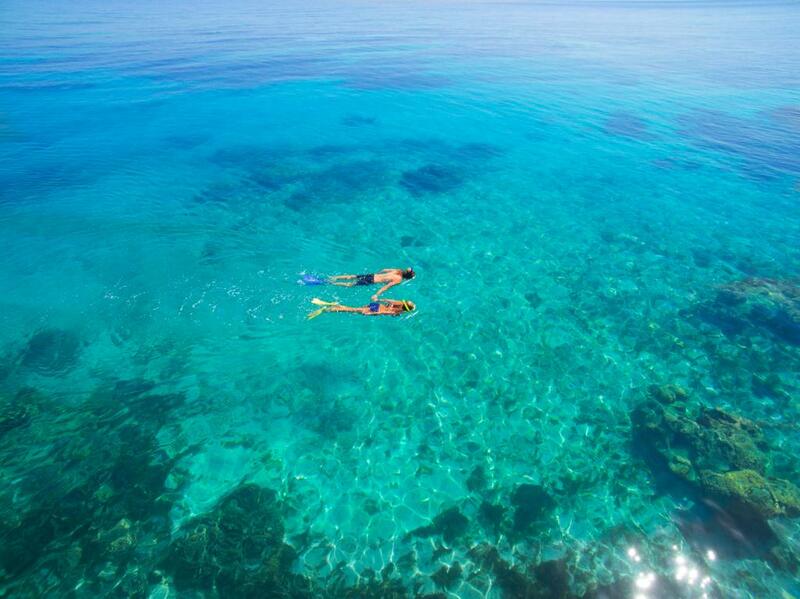 Surrounded by some of the best dive sites in the world, Vomo Island Resort enjoys access to fantastic snorkelling and scuba diving. The PADI Dive centre offers courses for beginners to advanced and even has a Bubble Blowers course in the swimming pool for kids aged 8-12 years. Specialist courses are also available for adults including wreck diver, underwater photography and night diving. 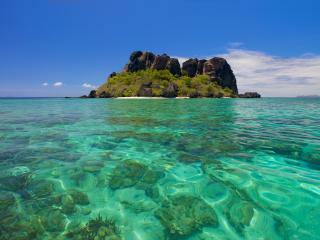 Contact resort staff to arrange a fascinating scuba diving trip out to the reef. Senikai Spa: The Senikai Spa is a place for rest, tranquillity and rejuvenation. 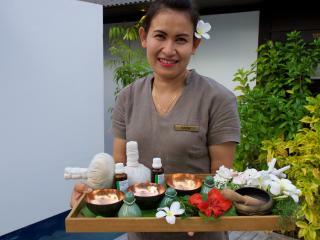 Designed to provide the finest health and body experience, the spa features an array of therapeutic treatments. The clinic only uses leading-edge products containing plant extracts and essential oils of the highest quality, and employs techniques to take clients far beyond the average spa experience. 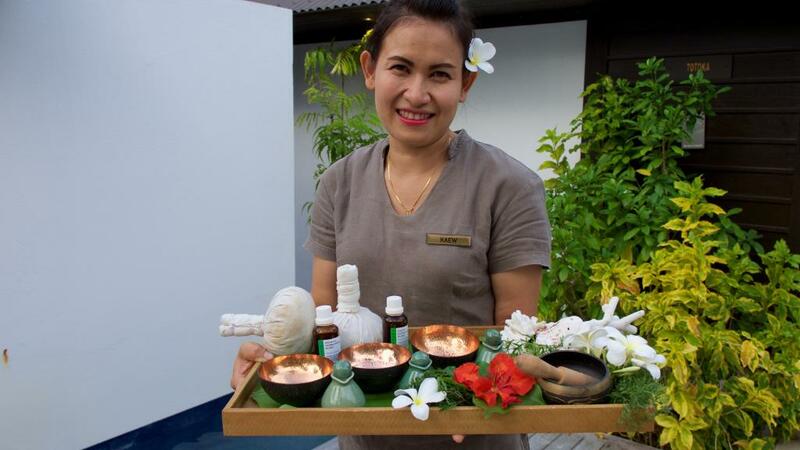 Vomo Island Resort's Beauty Therapy Spa is under the direction of one of Australia's highest qualified Beauty Therapists. 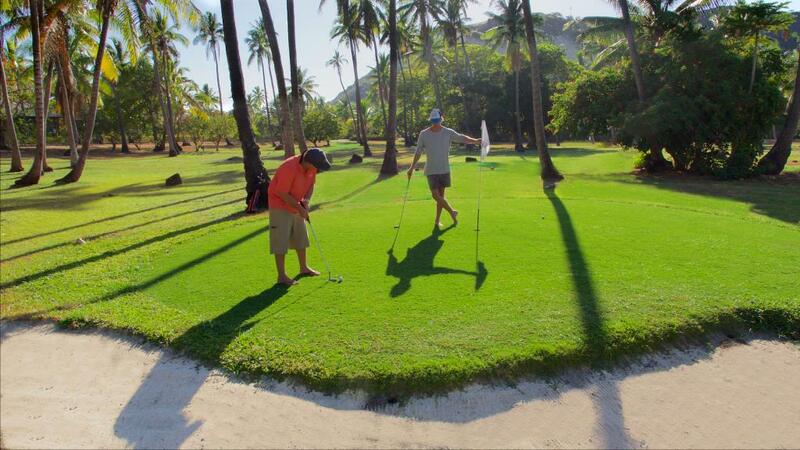 Vomo Island Resort offers a 9 hole pitch and putt putt golf course, which will challenge any player. 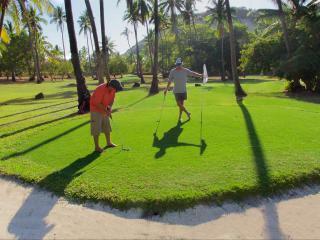 A great way to spend a lazy afternoon, clubs and balls are provided. Kids Village: The Kids Village is complimentary and is open year round from 10am - 9pm (times may vary) for children 4 - 12 years. Infants 3 years and under can attend if accompanied by a babysitter or parent/guardian. 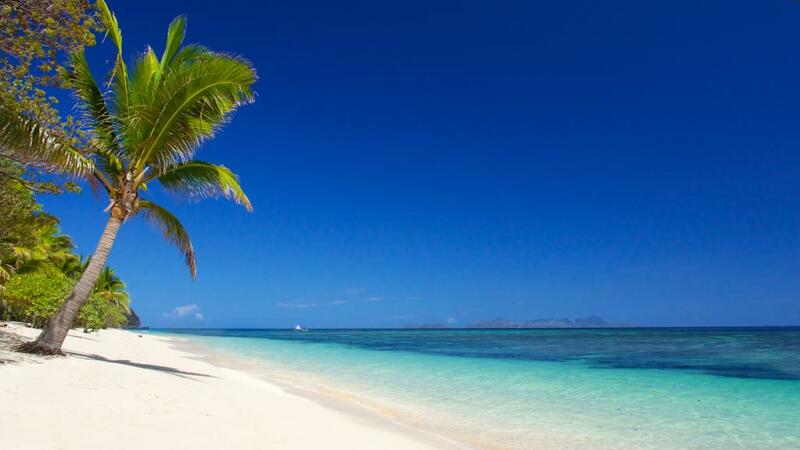 This exciting kids club includes activities such as painting, crafts, crab hunting, sand castles, disco & movie night and traditional Fijian dance and language lessons. Babysitting is available for a fee. Vomo Island can arrange as much or as little as you like for your special day. Weddings can take place any day of the week and what better place to spend your wedding day than on the beautiful sandy beaches that Vomo has to offer. (For Wedding packages & Renewal of Vows packages please contract Vomo directly). 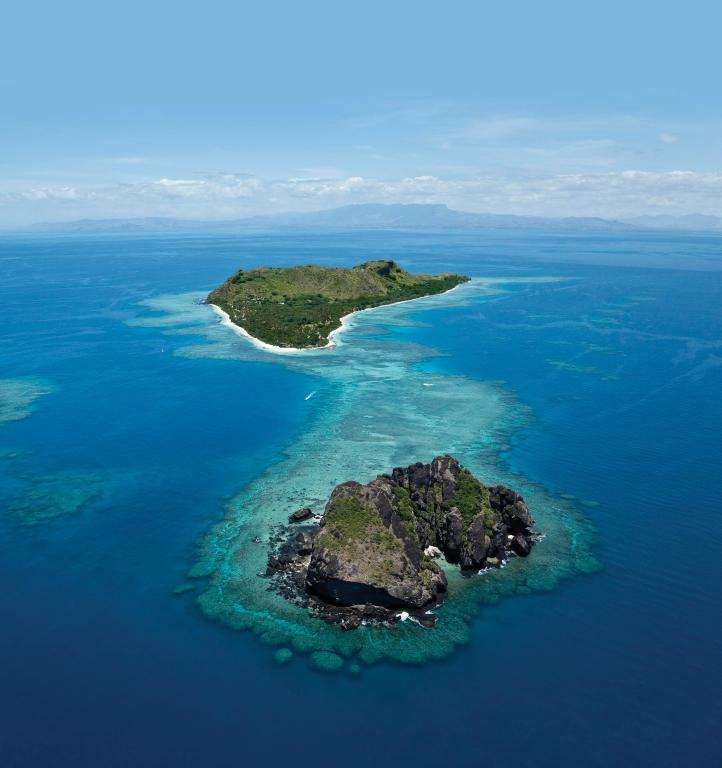 Vomo Island Resort is a 15 minute flight or hour cruise from Nadi, mainland Fiji. South Sea Island Cruises offer daily launch transfers from Denarau Marina. The sea transfer takes approximately 1 hour and 15 minutes. Guests can also arrive by seaplane or helicopter with flights departing daily. 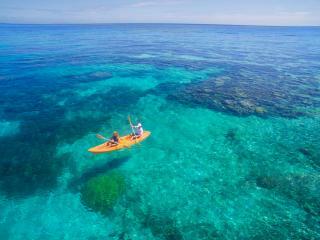 The seaplane transfer departs from Nadi's domestic airport and helicopter transfers from the International airport. Transfers can be arranged at the time of booking accommodation.